Anyone who knows me will know that I am not fast in anything I do. Recently I have increased my walking, currently my pedometer App tells me that I am averaging 8189 steps per day, that is much better than the 3 to 4 thousand I was averaging when I was using this App a year ago. Some days I manage 12k, I think I had only ever managed a maximum of 11k once before. The other evening we were discussing how much exercise we are both getting these days. Owl was saying that he feels so much fitter than he used to do.I on the other hand do not feel fitter. My stamina has increased. I can walk around delivering or picking up catalogues for an hour and a half without having to stop for a rest. Before this I had to rest after about 20 minutes. I am glad that my stamina is building up, it doesn’t stop my arms and legs from aching when I do stop though. I am still a slow walker, I guess it is possible that my walking speed has improved slightly, especially at the start, but not by much. All this extra walking that I have been putting in, is probably a contributing factor. My reduced appetite and receding sweet tooth have also contributed. To what? you might be asking. Today I had my half annual Diabetes check up, Along with blood tests and blood pressure, I was also weighed. In the last year I have lost one and a half stone. I did not do this by going on a diet. I did this by eating less and moving more. Slowly does it. I feel really proud of myself. It was Friday evening and I had a sudden craving for sausage and chips from the chip shop. Now we very very rarely go to the chip shop. I think we have probably only done this about four times in the two and half years since we moved to this house. I decided to combine my taxi service of picking up Skater from the station with a trip to one of the chip shops in the area. There is one in one of the housing estates between the station and home, we would go there. As I was driving towards the shop I could see that there were no available parking spaces, I figured that I would drive a bit further along the road and turn around to find somewhere to park. The couple of cars driving right behind me meant that instead I continued driving and ended up leaving the estate altogether. Never mind I would go to the one that I pass on my way to and from work. This is the one we have used before. I managed to park half on the curb at the far end of the car park. Leaving Skater in the car I walk to the small chip shop in the parade. I have never seen such a small chippy, barely room for a single line on people. I couldn’t tell which end of the shop the queue started. I stood in the doorway looking up at the meagre menu on the wall. I might be craving chips but I didn’t fancy getting anything from this establishment. I decided to continue my search. There is another chippy on one of the main roads not far from where I now was. So a few minutes later I pulled up outside the popular chippy we had gone to once before when the lads and their girlfriends were with us. I remember that service had taken an absolute age on that occasion last spring. Here I see that the only place to stop is in the bus lay by. I know I shouldn’t park here and Skater is not happy with me for doing so. As I pull out from behind the camper bvan taking up the majority of the bus stop I see a car pulling out of a space a few yards ahead. Damn, before I can get there another vehicle slides into the space from the other direction. Why oh why does everyone else want chips on the one occasion I have this craving. I could give up and go home, we do have food I could cook, but no I must satisfy this craving. On we go, where to next? Maybe I shall have to go into the town centre there is sure to be somewhere there in the parades near to the station. An area I have only visited a few times. We are nearing the town’s college where both Statto and Pug studied for their A’levels. If I go along the road that passes the college entrance I know there is a small parade of shops up there, I wonder would there be a chippy there? Oh great, I have finally found a chippy with parking spaces outside. Going into the shop I place my order, hand the girl who is serving, my debit card. They only take cash, I have no cash on me! I tell the girl I will be back. The nearest place to get cash is back where I had earlier stopped in the packed car park. This time there are a couple of spaces. I have to struggle to get out of my door as there is not enough room. There is a convenience shop in the corner which has a cash machine. I wait impatiently for the guy who is composing a whole album on the buttons of the machine. Finally he is finished and I can pay £1.75 for the privilege of taking out my own money. This done we drive back to collect our dinner. By now I am beginning to think that after all this running around in my quest to satisfy my craving, I will find that I don’t actually enjoy it once I get to eat it. I needn’t have worried though. I actually did enjoy my food and felt that driving around for almost an hour had been worth it in the end. During the week we had our Christmas get together for the writer’s group that I belong to. Whilst there, one of the other members was telling a new member that I am very self-effacing, unnecessarily so. I was quite surprised by this, but I shouldn’t have been. I do tend to keep quiet during our meetings, not offering many comments on the work of others. Timid about reading out my own work. Partly this is due to being eternally shy. Today I was having a chat online with someone about life in an abusive relationship. She commented that these relationships knock your confidence and it can take years to get that back. My first marriage was not violent in any way, shape or form. Yet the emotional abuse that I lived with for so many years took away all my confidence. Years of public put downs and insults take their toll. Being told frequently if not daily that I am. Did nothing for my confidence other than to batter it down time and time again. When I began divorce proceedings he began repeating the popular children’s nursery rhyme. Well actually, when said often enough words may not just hurt but they can cause lasting damage. After my marriage ended I went off the rails a bit, a friend of mine told me I was running around like a headless chicken. I began blogging and dating. I can see now that both were confidence tools. I needed to know that I was desirable, and worthy of friendship. I gained enormous validation through my blog and the friends I made there. Through my dating experiences I learnt that not only am I good enough for the men I was dating, but some of them were not good enough for me. Gradually I learnt to like myself as a person. My confidence began to build. I started a new job, I have been there for seven and a half years now. They tell me that I have grown so much since I first started there. (I know they don’t mean in weight, although that increased over the years I have been there). One thing I have tried to keep through out everything has been my sense of humour. For a long time after my divorce I would make jokes about myself. I would get told off for putting myself down, but that wasn’t what I was doing. I was showing that I don’t take myself seriously, that I can laugh at myself not just others. Maybe though there was a touch of laughing at myself before others get the chance. All my life I have been shy, introverted. I do have my moments of bravery. On occasions when I feel confident that I know what I am talking about, then I can come out of my shell. As for being self-effacing, I believe that is just a matter of confidence. I say very little at our writing group because I am so in awe of the talent I am surrounded by. Maybe in time some of the knowledge and skill will rub off on me too. It should be so simple. Why do I always fall into the trap of thinking that things will be simple? I am 52 years of age for heavens sake, I should have learnt by now. Nothing is ever simple. A few weeks ago whilst shopping I stopped at the key cutter’s kiosk. I wanted to get a spare key for our car, we have only ever had just the one key. I was told that because we drive a Chevrolet they were unable to cut a new key, they do not hold blanks for this make of car. They might be able to order one in but it could take a while. Owl searched online and placed an order for two spare key blanks. He had a little trouble placing his order, so we now have four blanks. Today I took two of these blanks back to the kiosk and asked them to cut the two keys for us. I placed the two blanks on the counter, only to be told. Oh why had I not known it would be down to this litigious society that we are forced to live in these days. Thinking about things not being as simple as they should be I had already had a feeling of let down having visited one of the main high street banks. I am sure that I have mentioned before that I am now the new treasurer for our writing group. I have been attempting to get the signatures on the Group’s bank account changed. It took a while to get the relevant forms downloaded and printed. Next the three of us who would be the new signatories had to take our forms into a branch of the bank to get our signatures authorised. I took mine in weeks ago. I was then told that I had to collect these forms from the others and bring them in together. This week I finally had all the forms, took them to the bank this morning only to be told that I now need to get another form signed by two of the existing signatories. Only then can the forms be sent off to the correct department, wherever that may be. I can’t even get a statement of our account until everything has been sorted which could still take a few weeks yet. At least I have been able to pay some money in. Whilst shopping I picked up a screw thread candle bulb for one of our light fittings on the stairway. Obviously I picked the wrong one. Yes it was a screw thread and yes it was a candle bulb, but the screw thread was the wrong size. I guess that tomorrow I shall be out getting another light bulb as well as finding an independent key cutter. What did you do today that wasn’t as simple as you had expected? Today I needed to collect something from Chichester, Owl was busy so I was going on my own. I am learning but I still don’t know my way around. I can find my way to some places but still need directions to others. We had gone into Chichester on Friday (being Black Friday) the roads were crammed. Parking was a nightmare.In the end Owl dropped me off whilst he drove off to find that elusive parking space. I thought about where I would park today, and how to get there. I had a look on google maps, that was when it hit me. The rail station was at the end of the road I needed to get to. A plan was forming in my head. I didn’t bother to tell Owl as he was already concentrating on his own plans for the day. My biggest worry as I set off was that the station car park might be full. Luckily there were a fair few spaces, however my problems were only just about to begin. I had always thought that there was only the one pay and display machine at the entrance, now though I could see another machine not far from where I had parked. Now when did they change these machines? I know I am not a frequent user but really! I could use my card in the machine or I could download an app or I could call the number on the board. I inserted my bank card but couldn’t make it go to the off peak charge of £2.00 it would only charge me for the day £6.50. I tried several times but still couldn’t get the machine to do what I wanted. So I changed to another method. I rang the number advertised, the automated voice gave instructions including asking for the number plate, make and colour of my car. Then it wanted to know if I wanted to pay for x amount of days or a month? Noooo I only wanted a few hours. I decided to walk over to the entrance to see if that machine still accepted coins, it didn’t. I paid for a whole day by card via the machine. Having gone back to my car I placed the ticket on the dashboard. A brief stop on the way into the station to purchase my ticket, this was a little easier as I have done this before. I only had 10 minutes to wait for my train. Luckily I hadn’t pre booked as I had seen three trains going by in the time I was messing around with ticket machines. The journey into Chichester was uneventful and fast as there were no stops ( well there were but we didn’t stop). Once at my destination, I did a spot of Christmas shopping, not much left to do now! Before making my collection. 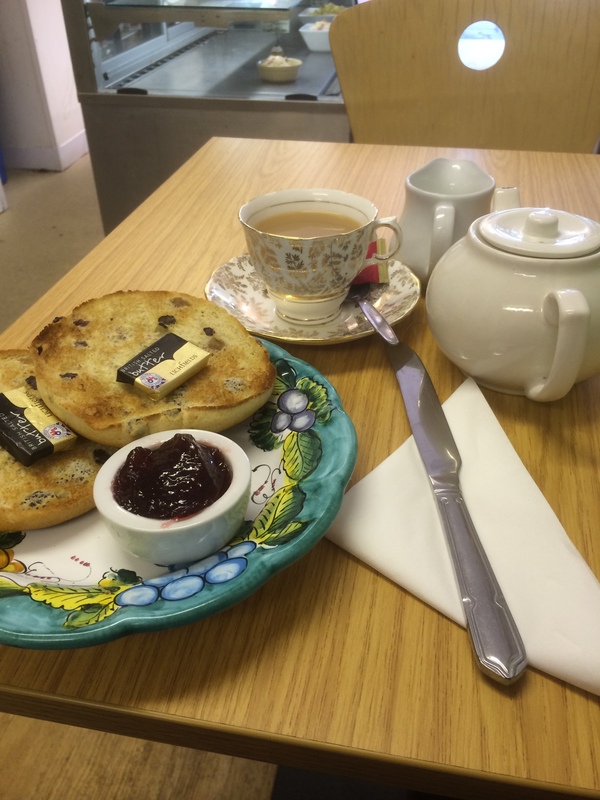 By then I was feeling thirsty so stopped at a small cafe for a cup of tea and toasted tea cake. Catching the train home I had 15 minutes to wait but the time went fairly quickly as I indulged in a spot of people watching. It was now the time of day that the local senior schools had finished for the day, so there were several teens in school uniform on both platforms. The train arrived and I stood with others waiting to board. I noticed among the others a hunched up old man. He followed me onto the train, I sat on the right of the carriage and the old man sat on the left opposite a young girl in uniform. At first I had thought the man was a down and out, but a glance sideways I changed my mind and figured that he was in fact just an old man hunched down into his coat against the cold wind. A few moments into the journey I noticed him fumble with the zip of his backpack. I though he was retrieving his phone as I could hear a muffled ringing. To my surprise he took out a bottle of jagermeister. He proceeded to take a swig from the bottle replacing in back into his bag. The young girl caught my eye but neither of us said anything. I half expected her to say something once he had left the train a couple of stops later. She didn’t, so I kept quiet also. It wasn’t long before I was walking back to my car, I was ready for home. On Tuesday morning I was resigned to using public transport to get around. Walking up the road I saw the bus that I had failed to catch the previous day. I didn’t mind as I would be going in the opposite direction on this day. Arriving at the bus stop on this cold damp windy morning I checked the bus schedule. Good there should be one at 7.52 and another at 8.02 which would be cutting it fine for me to get to the medical centre for 8.35. Only 12 minutes to wait shivering for my bus, I could do that. I wasn’t looking forward to my fast walk once I got off the bus in the town centre. By 8.00 I was getting concerned, by 8.05 I gave up and headed back home. I had just reached our gate when I saw my bus floating past the stop where I had been waiting. Well it was too late now. Once inside I phoned for a taxi which arrived just a few minutes later. No sooner was I inside the comfort of the warm taxi, I noticed that the rain had begun. I was at my appointment at 8.28 so there is no way I would have made it if I had caught the bus. After my appointment I rang for another taxi but had to wait until 9.00. I was at my desk by 9.15, much earlier than if I had caught a bus. During the day I was wondering how Owl was getting on with charging up the car battery. It was just getting dark when he called and told me that he had not been able to do anything. He believed that the ancient charger he had was not doing the job. With a flash of inspiration I left my office in search of my hero. One of the guys in an office in the same building had charged my car up for me a week or so before. When I found him I asked if I could borrow a charger over night. Which he was happy to do, but suggested I should get a lift home rather than going on the bus with it. When I discovered how heavy it was I knew he was right. One of my colleagues gave me and my charger a lift home in the pouring rain. Owl put the battery on charge overnight again. The plan being to put it back under the bonnet in the morning. This he did, I had already decided that if it didn’t work I would call a taxi again as I was not enamoured of the idea of carrying that heavy lump of metal and wires to and from the bus. Whilst I was getting myself ready for the day Owl was outside returning the battery to it’s housing. How we cheered when the engine not only turned over but continued to run well. There is no battery light and the dial is showing that the battery is charging as it should. All is well that ends well and we didn’t have to pay £300+ for a new alternator plus labour to get it fitted. Ok so it took longer but it only cost us £150 with Owl doing it himself. I had got Owl added to the insurance again last week so now I don’t have to do all the driving any more. I just hope he doesn’t do anything stupid and lose his licence again. As I reported a few days ago my poorly Chevrolet Blazer had to hitch a ride home on the back of a recovery vehicle. Since then Owl has taken out the battery which he has charged up. He has also taken out the faulty alternator. We have the new alternator sat on our dinning table waiting to be installed in its place. I have watched a video on how do this. Owl has watched the videos many times to make sure he is confident in what he has to do. There is one small thing stopping him from putting the new part into it’s place. When he was taking out the old alternator there were three bolts holding it in place. the two front ones came out easily. However the one at the back, whilst not difficult to extract, has become a problem of the mountainous kind. It pinged out of his grip and now rests somewhere unseen within the engine space. It has not reached the ground, that would be easy. It has been three days now, the gravel under the truck has been searched time and time again. Owl has peered into every conceivable crevice that he can see with the help of various torches. I have stood on the step stool so that I could look down into the engine armed with feather duster in the hopes that I might be able to dislodge the bolt from it’s hiding place. We even tried rocking the car from side to side. Owl has used the garden hose in an attempt to wash it out. So far nothing has worked. I have phoned the garage which has looked after Owl’s car for years. If we can give them the exact dimensions of the bolt they could find us something to use in it’s place. Even if he can find the dimensions we would have the problem of getting to the garage. I have suggested that perhaps he could put the new part into it’s position, securing it with the remaining two bolts then carefully drive to the garage, which is probably only about 3 miles away. Owl doesn’t want to do this as he doesn’t want the missing bolt to rattle around in the engine space causing damage. We are still searching for our second car but in the meantime we have no drivable car. Now if by magic the missing bolt comes to light then it will be all systems go. I never realised how much one simple bolt could affect my life. Just when Owl has got his new driving licence back too.